Acronis released a ransomware survey conducted in the US, UK, Australia, Germany, France and Japan. The results showed most users were completely unaware of the threat posed by ransomware attacks, and how to prepare for them. That’s not so good for suppliers selling anti-ransomware product, obviously. Acronis says ransomware criminals are expected to extort $5bn this year so – obviously again – you need to back up your data, and guess who can help? Yep; Acronis. CTERA says its automated file-level backup and recovery Cloud Server Data Protection Platform is available in the Amazon Marketplace. It can back up any number of Windows and Linux Amazon Elastic Compute Cloud (EC2) instances, and use AWS as a backup target for applications running on any cloud or object storage-based platform. There’s a wide range of APIs to enable in-cloud backup and file-level and application backup. Once you’ve bought it, CTERA says you can be up and running with five mouse clicks via support for AWS CloudFormation deployment templates. It globally dedupes and compresses backups at the source for protection in an Amazon Virtual Private Cloud (VPC), across AWS Availability Zones, and across cloud providers. We’re told it can use information lifecycle tools from Amazon Simple Storage Service (Amazon S3) to place backup data on Amazon’s S3 Standard – Infrequent Access tier (Standard – IA), where storage is priced as low as $0.0125/GB/month. Rack-scale NVMe-over-fabrics all-flash array startup E8 has decided to use HGST Ultrastar SN200 NVMe SSDs, with up to 153TB in its 2U enclosure. The SN200 is a dual-ported SFF 2.5-inch drive, with up to 7.68TB capacity. Fujitsu has a new server, said to be its smallest ever. The Primergy TX1320 M3 has a small tower cabinet and can sit on a desktop or bookshelf. This box features Xeon E3-1200 v6 product family, Core i3, Pentium and Celeron processors plus up to 64GB DDR4 main memory. It has up to eight 2.5-inch hard drives, RAID controllers, 4 x PCIe slots, backup and networking options, TPM 2.0 capability and redundant power supplies. Get more tech details here. 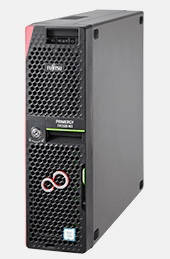 It is one of Fujitsu’s updated mono-socket server line, with the others being the TX1310 and TX1330 towers and RS1330 rack server, all of them suffixed -M3n and being an update on the previous M2 generation products, with newer Xeon processors. Fujitsu says the TX1320 M3 set a world record score of 74.6 in terms of processor performance for Xeon E3-powered systems, in the SPECint2006 benchmark.The RX1330 M3 has a score of 271 in the SPECint_rate2006 benchmark test. The TX1320 M3 and other M3 models are shipping and prices vary by region, model and configuration. IDC says that, according to its Worldwide Quarterly Cloud IT Infrastructure Tracker, vendor revenue from sales of infrastructure products (server, storage, and Ethernet switch) for cloud IT, including public and private cloud, grew by 9.2 per cent year-over-year to $32.6 billion in 2016, with vendor revenue for the fourth quarter (4Q16) growing at 7.3 per cent to $9.2 billion. The top five vendors were Dell, HPE/HC3, Cisco and Huawei, with IBM, Lenovo and NetApp tied for fifth place. 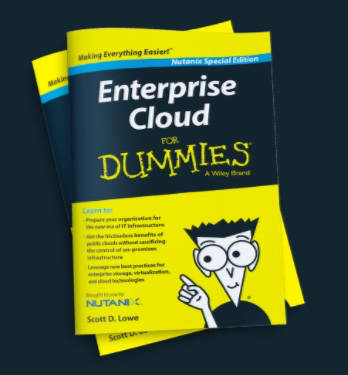 Nutanix has sponsored an Enterprise Cloud for Dummies book. If you really really need to read it you can find it on the Nutanix web site. If you want to know how to access a web site we have a Web Site Access for Dummies Book. And for those of you with limited perspicacity, knowledge and nous, but who can just about read, we have, as a special offer, a What is a Dummy for Dummies book in large print format with lots of pictures. Syneto is a hyperconverged infrastructure appliance vendor. Its Hyper Series 3000 is a range of hybrid and all-flash hyperconverged products with built-in instant disaster recovery (DR) capabilities; users can restart their infrastructure on the DR unit within 15-30 minutes. The company has offices in Italy, Switzerland and Romania. Hyperconverged infrastructure software provider Virtuozzo and cloud infrastructure services provider Packet have a combined offering for service providers and enterprises to take advantage of hyperconverged infrastructure products on-demand. They claim it’s highly cost-effective and customers can deploy Virtuozzo’s software for containers, virtual machines and storage in minutes from the Packet private cloud. The two say they have dedicated infrastructure in 4 locations – Silicon Valley, New York, Amsterdam and Tokyo – deployed via API, web portal or common integrations tools like Terraform or Ansible. There are hourly and monthly billing options and licensing, networking and all hardware are configured automatically. Find out more here and get a $50 credit. Phil Bullinger moves from heading Dell EMC’s Isilon systems business unit to become Datacenter Unit SVP at Western Digital. The previous Datacenter unit head, Dave Tang, becomes SVP marketing at Western Digital. Infinidat has appointed Greg Scorziello as UK country manager, replacing the departed Jasper Gundry-White. He comes from being a GM EMEA at Actifio and is an ex-IBM XIV staffer. (With reference to Seagate) Professor Robert Bowman of Queen's University Belfast has been appointed as a new Research Chair in Advanced Materials for Data Storage, starting a five-year project to research and develop new materials for use in the next generation of hard drives – meaning HAMR. We’re told current designs for the key element of HAMR – the plasmonic antennae – lack the thermal robustness to stay reliable for the lifetime of a hard drive. New materials are needed. Seagate’s nearby Springtown plant builds disk read/write heads.